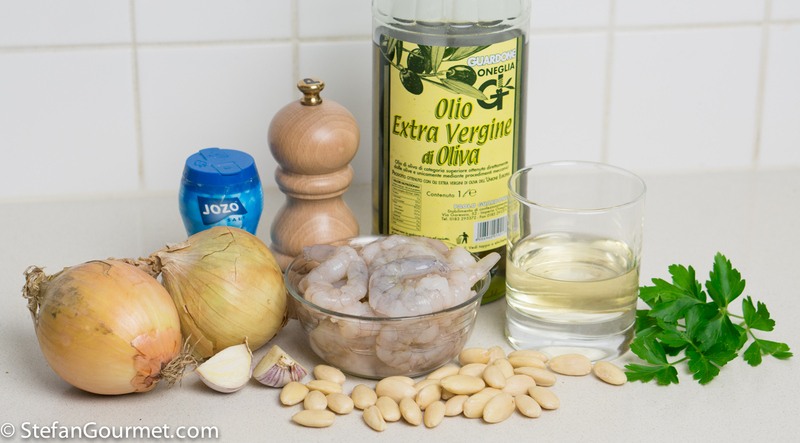 Combine the shrimp in a bowl with 1 Tbsp extra virgin olive oil, 1 or 2 minced cloves of garlic, 1/2 tsp salt, and 1/4 tsp freshly ground white pepper. 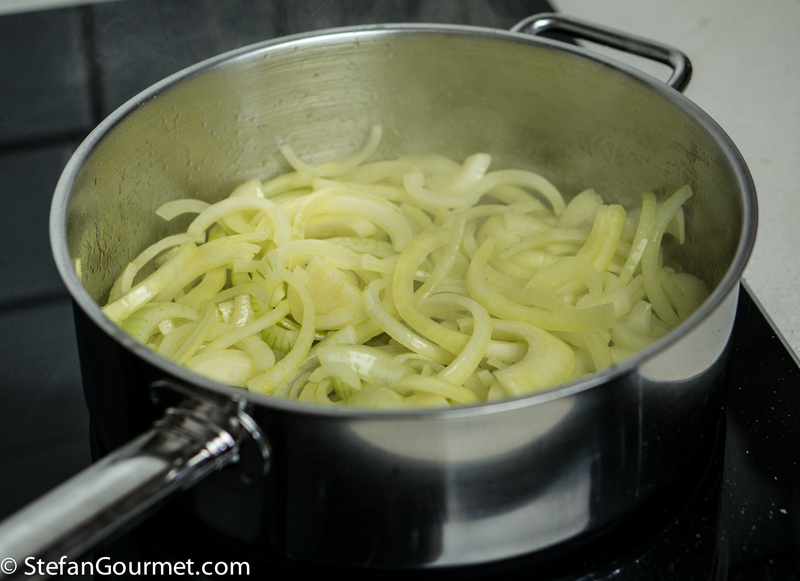 Stir to mix and allow to marinate in the refrigerator while you cook the onions. Heat 2 Tbsp olive oil in a frying pan. 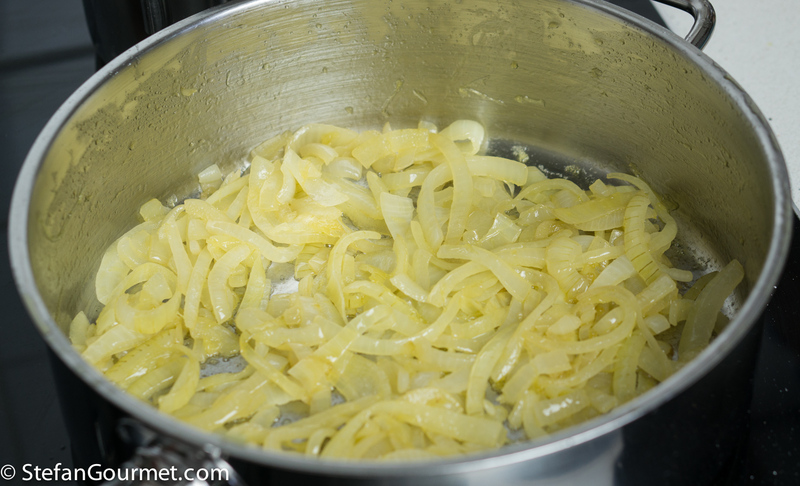 Add 2 thinly sliced onions and stir them for a minute to coat them with the oil. Season lightly with salt. Add 120 ml (1/2 cup) of dry white wine. Lower the heat and cook for about 30 minutes, stirring regularly. Add a bit of water if needed. The onions should become soft, but not mushy, and only slightly golden. 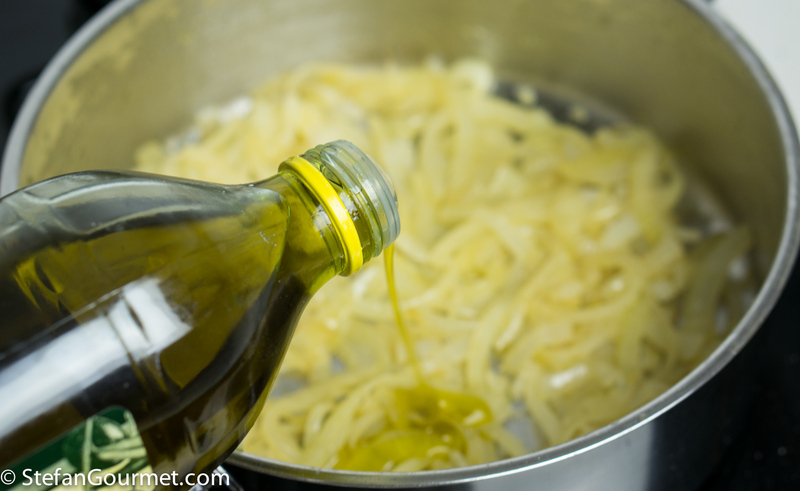 After half an hour, add the final tablespoon of extra virgin olive oil. 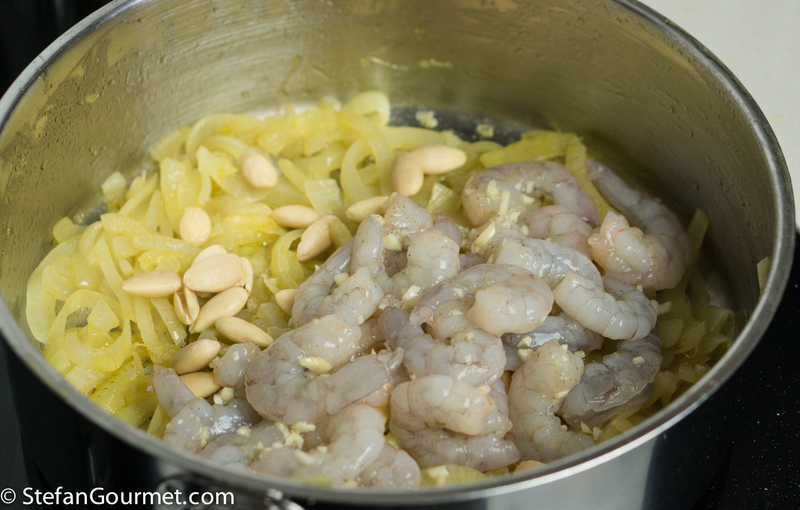 Then add 40 grams (1/4 cup) white almonds, increase the heat, and stir for a minute. 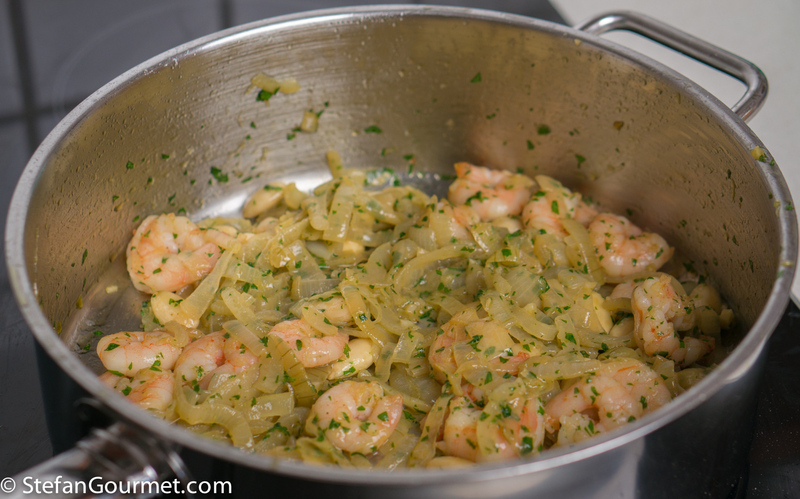 …and stir over medium high heat until the shrimp is just cooked through, about 2 minutes. Turn off the heat. Add a tablespoon of minced parsley, and stir to incorporate. Taste and adjust the seasoning with salt and freshly ground white pepper. 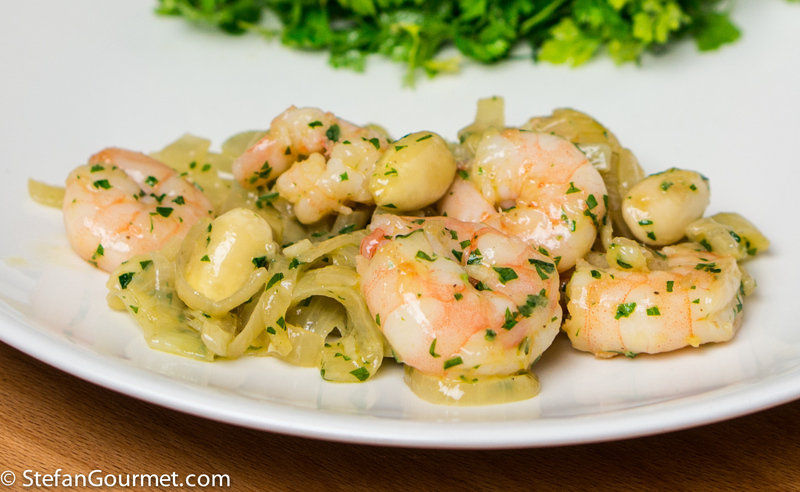 Serve at once or at room temperature with a bit of green salad or as part of a collection of seafood antipasti. 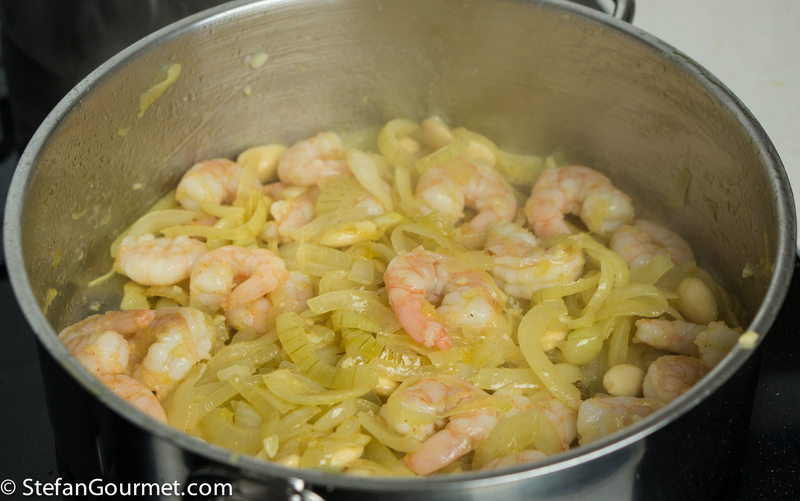 At the last moment, squeeze a few drops of lemon juice on top of the shrimp. An Italian dry white with a hint of almonds such as many Soave or Verdicchio would be an excellent choice. 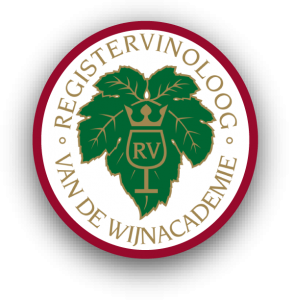 Do not pick a wine with new oak or high acidity. 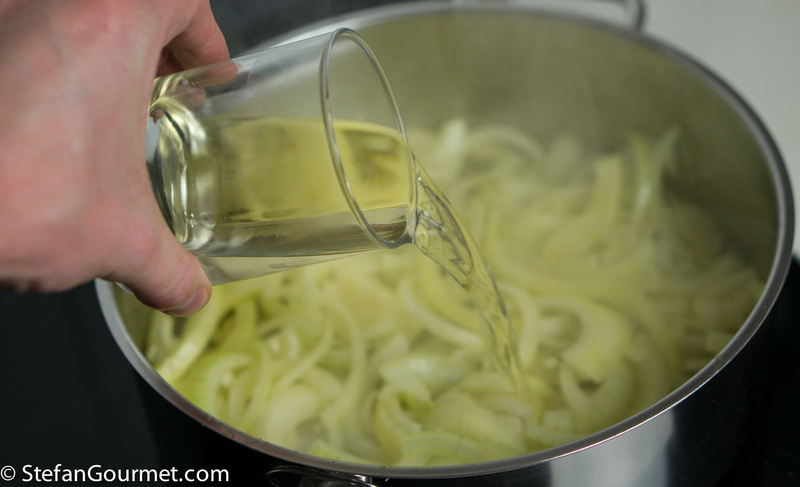 If the wine seems to acidic with the dish anyway, add a bit more lemon juice. 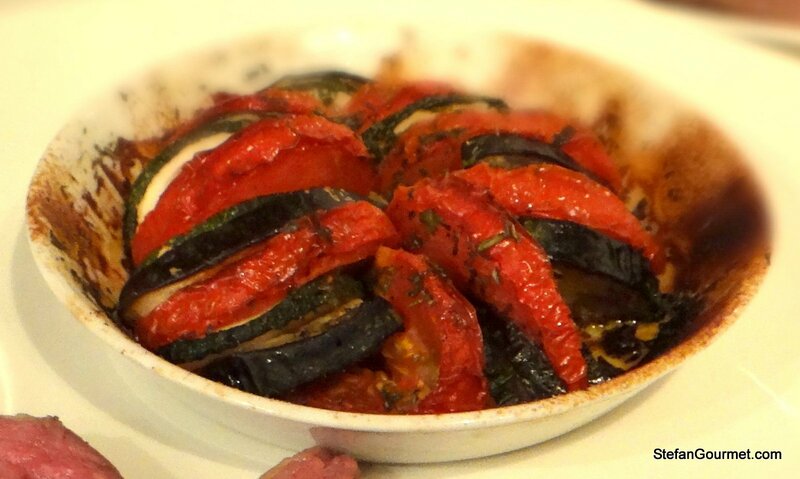 This traditional tian provençal is made with eggplant, zucchini, and tomato. Don’t let the simplicity fool you: this tian bursts with flavor thanks to the slow roasting and the herbes de provence. That looks delicious, and perfectly cooked. I loved the way you gave background and meaning to the dish- and beautifully described the balance of flavor. 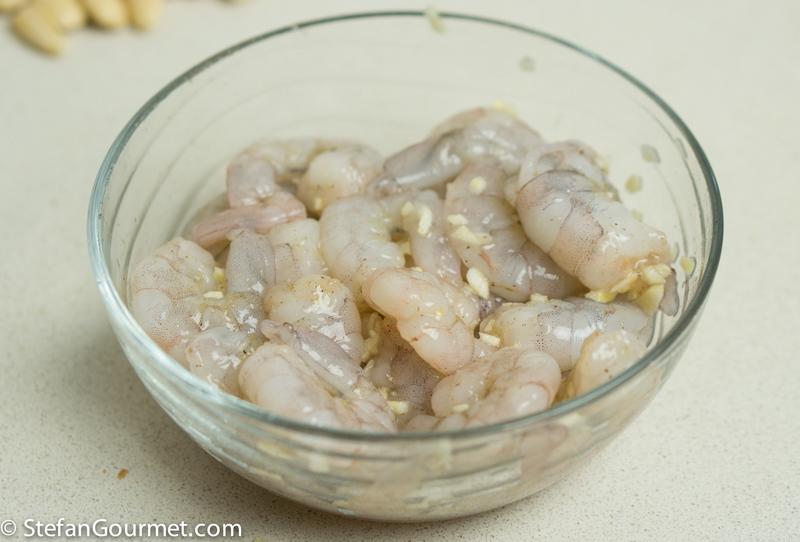 I have some beautiful, sweet shrimp and will try this. Greg is from a region known for vidalia onions, which would be perfect. The almonds are marcona or blanched? They look like a nice textural component. You and Kees eat like kings. Thanks, Shanna. 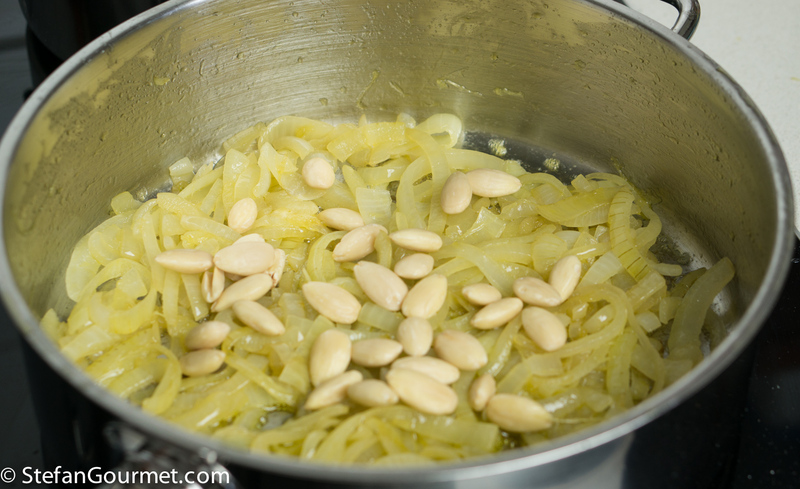 The almonds are blanched. This with a green salad would be more than an adequate main meal for me! The name was familiar so had to go back into your records naturally and did find ‘Mackerel Saor’ from about three years back . . . Venice? Croatia? Does it matter when it is obviously so delicious . . .
I’d add some freshly baked crusty bread to that 😉 Venice and Croatia are along the same coast and their cuisines are closely related. Non solo sarde in saor ma anche scampi o gamberoni. Bontà infinita. Coi gamberi non l’avevo mai vista! Come dev’essere buona! I would love that with a nice dry white. Very tasty. I’m off to an Indian food and wine pairing evening tonight in Ananda, probably Ireland’s best Indian restaurant. Sounds great! What was it like? Did the wines work? What was your favorite pairing? I will have to get my notes together (along with the menu) as we managed to allow ourselves be completely over-served. A great night was had!